With the help of Couture Landscapes, you will be able to extend the daylight beauty of your landscape, garden and home well into the night. 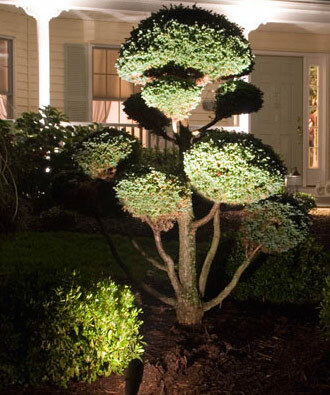 Our expert technicians install all types of landscape lighting to compliment the various focal points of your home. With years of experience in outdoor lighting for homes, we’re your local exterior lighting experts. From small LED accent lights to classy post cap lighting, we offer a wide range of outdoor lighting products to enhance the night-time look of your home. Whether you want lightscaping for safety or aesthetics, we can properly install outdoor lighting fixtures so that they enhance the look of your home. 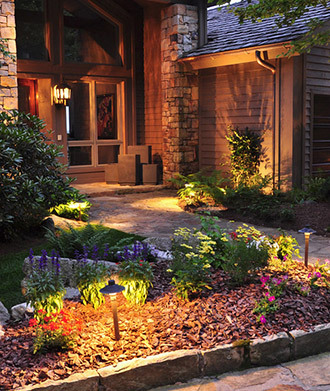 Homeowners prefer landscape lighting for their gardens, entrances, patio, lawns and water features area because it offers a more finished look for your landscape. A Whole New Level of Beauty at Night! When we’re at your home for a design consultation, we need to know the purpose of your landscape lighting needs. Whether you want to enhance the beauty of your home or want the benefit of added security, our team can provide the best lightscaping. With the help of special outdoor lighting, we can create beautiful focal points around the home – improving the visual beauty of your home’s exterior. Our team will take into consideration the specific lightscaping needs, ease of use, functionality and quality of the lighting equipment to offer something that meets your needs. A combination of the right types of nightscaping elements can really bring night-time beauty to any home. Whether you want to bring attention to the architectural features of your home or offer visual safety to your guests, Couture Landscapes has the right selection of lighting products for you. Whether you need maintenance or landscape lighting in Oakville, Burlington, Mississauga, Milton, Port Credit and Etobicoke – please give us a call at 416-707-9492.